Overhead Door of Nova Scotia is a certified Garaga Expert. Our company was established in 1956, and has operated under current management since 2002. Our focus is 100% customer satisfaction which is ensured by expert technical assistance and top quality garage door systems manufactured by Garaga, the largest Canadian manufacturer of garage doors. We sell, install, repair, and service all types of residential, commercial, industrial, and agricultural doors. In addition, we offer specialty doors, such as high‑speed/rapid roll doors as well as accessories, gates, security grills, shutters, etc. As garage doors are bought only once or twice in a lifetime, expert advice is essential. Our highly trained technicians, with between 3 and 35 years of experience in professional installation and repair services, will assist you in choosing the door best suited for your project and budget. You can visit our image gallery or stop by our showroom located at 101‑420 Higney Ave, Dartmouth, NS to see a selection of our overhead garage doors. We will help you will find the perfect door that will add value to your home or business. Please contact us for a free estimate; we also provide a free at‑home estimate and design consulting service in the HRM (Halifax Region Municipalities). Most homeowners use the garage door as the main entrance into their homes. The garage door is also the biggest and heaviest moving object in a house. Therefore, this door needs to be operated by a dependable and safe garage door opener. LiftMaster®, manufactured by Chamberlain® Group, is the world's #1 professionally installed garage door opener. Because of its advanced features and ease of use, we recommend it to all our customers. For information regarding the performances and features of our garage door openers, please visit our door opener section. Visit our showroom, or call us today and our expert team will assist you in finding the appropriate garage door opener for the size and weight of your door. Overhead Door of Nova Scotia is a certified Garaga Expert. We provide specialized installation, repair, service, and maintenance of various types of residential, commercial, industrial, and agricultural doors, door openers, and accessories. Our staff stands out for the quality of service and the care we put into what we do every day. We believe in quality service and we proudly stand behind our work. Some of our longest‑serving technicians have 35 years of experience. Our company follows the Nova Scotia Construction Safety Association program, and our entire staff is trained regularly by outside safety professionals. Our aim is 100% customer satisfaction! Please call today to schedule a repair or inspection. For your peace of mind, you can take advantage of our preventive maintenance program. We serve Mainland Nova Scotia, Halifax, the HRM (Halifax Region Municipalities), Dartmouth, Halifax, Chester, Lunenburg, Bridgewater, Truro, New Glasgow, Wolfville, Windsor, Kentville and Liverpool areas. Mainland Nova Scotia, Halifax, Kentville, HRM (Halifax Region Municipalities), Dartmouth, Halifax, Chester, Lunenburg, Bridgewater, Truro, New Glasgow, Wolfville, Windsor, Kentville, Bedford, Sackville, New Minas. Who are we at Overhead Door of Nova Scotia? 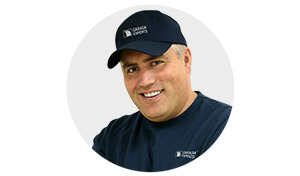 Your GARAGA Garage Door Specialist in Nova Scotia.